Live streaming has become a popular trend for performing arts organizations, and many have turned to Facebook to broadcast their shows. Facebook Live is one of the fastest and easiest ways to live stream an event and reach thousands of viewers. Two-thirds (68%) of U.S. adults and 51% of Americans ages 13-17 use Facebook, making it a useful resource to reach people of all age groups. Additionally, 93% of NGOs worldwide have a Facebook page and 41% have used the platform to report live from an event or showcase their work. Accessing Facebook Live is a simple process – just log into your organization’s Facebook account with a device that has a camera and click the “Live” option at the top of the page. If your organization does not have a Facebook page, you will have to create one or use a different account. Having an account devoted to your organization, however, will keep your live videos directly connected with your organization and make it easy for users to follow all postings by your organization. Before starting the video, Facebook allows you to write a description of the video, tag a location or people, and choose your privacy settings. An option to add a donation button is available by clicking the three dots in the top right corner. This is particularly useful when live streaming fundraising events. Your live stream will not start until you press “Start Live Video” and can last for a maximum of four hours. Once your live stream is done, you must click “Finish”. Then you have the option to post the live stream so that viewers have access to it in the future. If you do not do this, the video will be removed from Facebook. You can also download the video to your camera roll to keep an original copy. 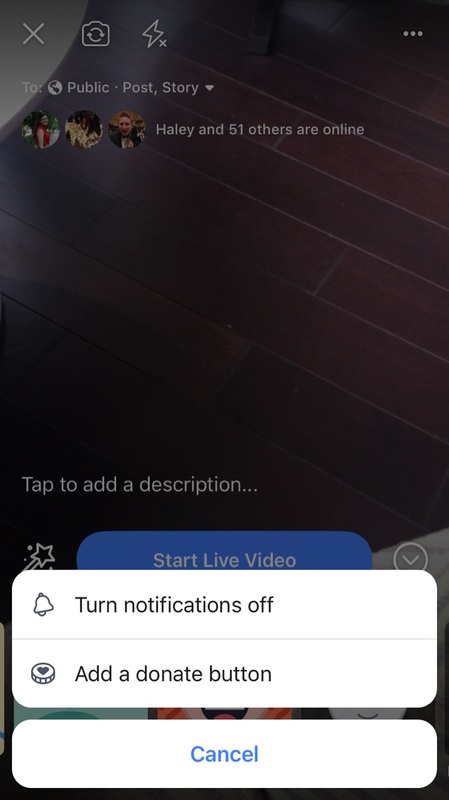 Along with marketing your Facebook Live event, audiences will know about your live stream by simply seeing it in their newsfeed or by receiving a notification if they recently interacted with your organization’s page. This ensures that anyone with high levels of interaction with your organization through Facebook will be aware of your live stream. One of the best parts about Facebook Live is the ability to interact with viewers. Viewers can comment on the live stream in real time, and your organization will be informed of these comments and is able to respond immediately. This is a nice engagement feature, in that viewers have the opportunity to feel involved with your organization and its event. Furthermore, organizations can use this feature to strengthen relationships with viewers by responding to their comments and showing gratitude for their support. Additionally, viewers can interact with each other and showcase their support publicly, helping to strengthen your audience base and online presence. Facebook Live is a great tool for organizations who want to broadcast events at little or no cost. One of the biggest downfalls, though, is the lack of professionalism and quality associated with Facebook Live. The quality of your live stream depends on the camera you are using and the strength of your Wi-Fi connection. Without high-quality equipment, you run the risk of broadcasting a video that could do more harm than good for your organization. Additionally, Facebook is a casual social media site, meaning live streaming through the site may appear unprofessional. If viewers want a high-quality live stream on a reliable platform, Facebook Live may not meet their expectations. Live streaming through Facebook requires proper compliance with copyright laws and union regulations. Content used for a Facebook live streams either can not include materials with a copyright or the stream must be paid for within a copyright license. Furthermore, unions have policies regarding videos and streamed performances, which involve royalties, timing of streams, and granting permission to use footage. Along with complying with copyright owners and unions, arts organizations using Facebook Live must consider audience members who are included in the stream. According to right of publicity restrictions, any recorded video that’s used for commercial or promotional purposes must obtain permission from all individuals shown in the broadcast. To legally and ethically stream a performance, arts organizations must gain necessary permissions from all who are involved. Adding Facebook Live to its streaming strategy increased Lincoln Center’s live views by 818% year-over-year. The California Symphony used Facebook Live to kick-off their 30th season at a total cost of $2,515.88 and used the stream to target new audiences while deepening their engagement strategies. The Kennedy Center uses Facebook Live nearly every day to broadcast their free performances on their Millennium Stages. Facebook Live is a great tool for organizations who want to increase the accessibility of their events, expand their online presence, and reach a wider audience. Many organizations may find it beneficial to start their live streaming journey with Facebook Live (and ensure that all streams follow copyright laws and policies on obtaining necessary permissions), continue to use the platform for events that are likely to attract a lot of Facebook users, and invest in higher quality live streaming services as they grow. John Gramlich, “8 Facts About Americans and Facebook,” Pew Research Center, October 24, 2018, http://www.pewresearch.org/fact-tank/2018/10/24/facts-about-americans-and-facebook/. Nonprofit Tech for Good, “2018 Global NGO Technology Report,” accessed December 14, 2018, http://techreport.ngo/wp-content/uploads/2018-Tech-Report-English.pdf. Nick Mattingly, “Copyright Rules for Facebook Live Video – How Not to Get Flagged,” Switcher Studio, June 23, 2017, https://www.switcherstudio.com/blog/copyright-rules-for-facebook-live-video-how-to-not-get-flagged. Technology in the Arts, “Social Media, Video Footage, and the Law: What Performing Arts Managers Need to Know,” accessed December 14, 2018, https://namp.americansforthearts.org/sites/default/files/documents/conference/2010/Social_Media_Video_Footage_and%20the_Law.pdf. Mark Dumschat, “How to Legally Live Stream Your Event,” EventMobi, November 11, 2015, https://www.eventmobi.com/blog/how-to-legally-live-stream-your-event/. Agnes Teh Stubbs, “Livestreaming Cultural Events: How to Engage and Grow Your Community,” Livestream, accessed December 14, 2018, https://livestream.com/blog/livestreaming-cultural-events. Aubrey Bergauer, “You Don’t Have to be the New York Philharmonic to Stream Your Opening Night Concert on Facebook Live,” Medium Corporation, October 6, 2016, https://medium.com/@AubreyBergauer/you-dont-have-to-be-the-new-york-philharmonic-to-stream-your-opening-night-concert-on-facebook-dd32f7ffb253. The Kennedy Center, “Recent Broadcasts,” Millennium Stage, accessed December 14, 2018, https://www.kennedy-center.org/video/recentBroadcasts. Bergauer, Aubrey. “You Don’t Have to be the New York Philharmonic to Stream Your Opening Night Concert on Facebook Live.” Medium Corporation, October 6, 2016, https://medium.com/@AubreyBergauer/you-dont-have-to-be-the-new-york-philharmonic-to-stream-your-opening-night-concert-on-facebook-dd32f7ffb253. Dumschat, Mark. “How to Legally Live Stream Your Event.” EventMobi, November 11, 2015, https://www.eventmobi.com/blog/how-to-legally-live-stream-your-event/. Gramlich, John. “8 Facts About Americans and Facebook.” Pew Research Center, October 24, 2018. http://www.pewresearch.org/fact-tank/2018/10/24/facts-about-americans-and-facebook/. Mattingly, Nick. “Copyright Rules for Facebook Live Video – How Not to Get Flagged.” Switcher Studio, June 23, 2017, https://www.switcherstudio.com/blog/copyright-rules-for-facebook-live-video-how-to-not-get-flagged. Nonprofit Tech for Good. “2018 Global NGO Technology Report.” Accessed December 14, 2018, http://techreport.ngo/wp-content/uploads/2018-Tech-Report-English.pdf. Stubbs, Agnes Teh. “Livestreaming Cultural Events: How to Engage and Grow Your Community.” Livestream, Accessed December 14, 2018, https://livestream.com/blog/livestreaming-cultural-events. Technology in the Arts. “Social Media, Video Footage, and the Law: What Performing Arts Managers Need to Know.” Accessed December 14, 2018, https://namp.americansforthearts.org/sites/default/files/documents/conference/2010/Social_Media_Video_Footage_and%20the_Law.pdf. The Kennedy Center. “Recent Broadcasts.” Millennium Stage, accessed December 14, 2018, https://www.kennedy-center.org/video/recentBroadcasts.